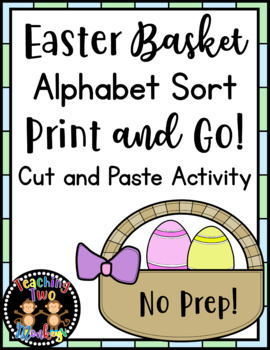 This Easter Basket Alphabet Sort is a cut and paste engaging activity that requires NO prep! Just Print and Go! All letters Aa-Zz are covered in this resource. The pages are in black and white (saves your colored ink!) so students can color each page. 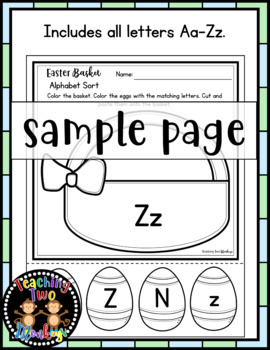 Each basket focuses on an uppercase and lowercase letter. Students find and color the eggs with the matching letters. Then cut and paste the eggs onto the basket. The letters chosen for each page are similar in shape or are commonly confused together. 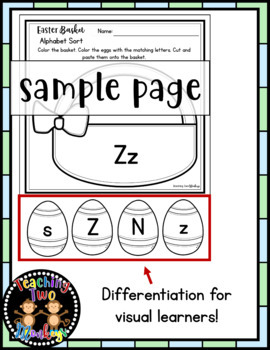 This differentiation is great practice for visual learners or for any little who needs more practice in letter recognition. You could even use these in day care with 2 and 3 year olds or SPED, homework, extra practice, homeschool, etc. So what's included? There are 26 pages. Each page focuses on a different letter. All letters Aa-Zz are included.